According to Wikipedia, Stewardship is a theological belief that humans are responsible for the world and should take care of it. “In the Christian tradition stewardship refers to the way time, talents and material possessions or wealth are used or given for the service of God.” Each of us must determine how stewardship is best reflected in our own life. 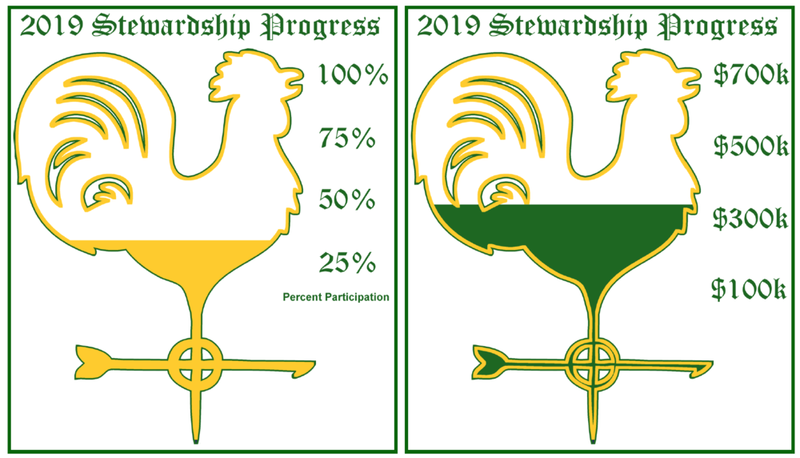 At this time of the year, Trinity’s Vestry is focused on financial stewardship as we look ahead to managing the physical plant and employing the people that make Trinity “possible” for its parishioners and others who rely on or benefit from its presence in the community. This does not mean that time and talent aren’t important for they provide the human context that dollars alone can lack. In future issues of Genesis I’ll give some examples of my own experience with non-financial stewardship as well as examples from other parishioners that I hope will provide a context and rationale for our current monetary focus. In the meantime, If you haven’t submitted your pledge for 2019, please take a few minutes to do it today. You can fill it out online at by clicking on HERE, or fill out a pledge card located in the back of the church or in the church office. The more information we have the better we can budget for the future needs and ministries of Trinity. As of November 25, Trinity received 2019 pledges from about one-third of the congregation, total-ing $313,000. Our 2019 goal is $675,000 to cover slightly more than half of our personnel and other operating costs. We have some distance to go, fellow parishioners. Have you made your pledge to Trinity for 2019? This is a time of transition here at Trinity Church as well as in the nation and the world. At Trinity, we know that – like a rock – you are always there to provide help and support. Steadfast support for Trinity is an example for others and a material representation of your affection for the Lord and for our community. As a Steward of Trinity, you are helping manage and protect that which belongs to God. We hope you agree that we are Stewards of the lives we are given, stewards of this church, the outdoor chapel, stewards of the environment, and much more. These are God’s gifts on loan to us. We each must decide how to re-pay that loan. Growing in our spiritual lives means, in part, growing in our lives as stewards of Trinity Church, one of God’s many gifts. Please consider sending in a pledge card before the end of December if you haven’t already done so. Consult your financial advisor to find out how a contribution to Trinity can work to your benefit. If you need a pledge card, please call the Church office. If you have not fulfilled your pledge for 2018, we hope you can do so promptly. June 23 was Church Vitality & Stewardship Day in the Diocese of Virginia. On that day, the Diocese conducted a set of stewardship workshops designed to help Virginia congregations use “the gifts God gives us to do the work God calls us to do.” Held at historic Aquia Church near Fredricksburg, the meeting was presided over by Bishop Shannon Johnston, and Bishops Susan Goff and Bob Ihloff and largely orchestrated by Julie Simonton, Director of Congregational Development and Stewardship for the Diocese. It was both an inspiring and useful exploration of the modern Church’s role in society and the ways in which it can be more effective in serving the needs of parishioners while it is also securing its own financial and operational future. The information shared at Aquia about annual and proportional giving, bequests and related financial instruments, endowments, and the communications and other opportunities that technology affords us will benefit Trinity Church and help us leverage the skills of our own talented parishioners and the experiences of other churches to enable Trinity to attain new and higher goals and commitments. Meanwhile, Trinity’s Stewardship Committee has been active in reassessing what can be done to strengthen connections among the congregation and investigating how to strengthen Trinity’s budget and provide the support that enables Trinity to care for and serve its members and the larger community. In that spirit, the Committee and the Vestry met in Cox Hall with Julie Simonton on June 11. It was clearly an eye-opening conversation that ranged over a number of important aspects of stewardship and how Trinity’s message can be made more apparent and relevant to parishioners of all ages and to people in the region. The Cox Hall meeting generated new spirit and enthusiasm and a number of proposals for action that we will evaluate over the summer. Julie has assured us it will not be her last trip to Trinity. But, the job is now ours to undertake. We would absolutely WELCOME additional ideas from our Genesis readers – consider this YOUR invitation. These two meetings have set the stage for future decisions about how to freshen up our annual giving requests, make planned giving easier, and improve the Church’s long-term financial outlook in order to enhance outreach, music, congregational care, and to do God’s work as He gives us to see it. The Diocese’s annual motto – NOW into the World! – captures that spirit. As Bishop Goff told us in the context of “changing the verb” in pursuit of our mission in this time of change and uncertainty: focus on what there is to “gain” by change and innovation, not on what is “lost”; instead of asking people to “come” to church, be willing to “go” where the need is; instead of saying I “have” a church, “be” the church; instead of trying to “survive” be willing to let old ways “die” when the need to modernize our Church requires it -- while maintaining our commitment to Christ and each other, of course. That’s both a challenging and an optimistic message. It’s about everyone at Trinity being its steward. $588,367.00. This meets our most ambitious expectations and we thank the 156 pledging parishioners for their historic commitment. The best news is that we have yet to hear from some of our 2017 pledgers. If they could simply renew at last year’s level, we would conclude this pledge season with over $620,000, which would advance our goal of strengthening Trinity Church’s financial position and set the stage for meeting the major financial obligations facing the congregation down the road. In my last letter sent directly to many of our Genesis readers from whom we have not heard this year, we asked that you please complete a short survey so that, pledging aside, the Church and Father Banse can better understand whether you think the Church is doing all it can to help and serve you and the Lord. We ask again, please respond so that Trinity can remain your “home” during this year of change and uncertainty. Thank you for sharing with the Trinity community your life as a follower of Christ. We are writing to remind you that Trinity’s continued financial health and the integrity of its campus are not birthrights. We work at maintaining our mission and our facilities every day. As you recognize, stewardship is the life of the church; pledging is an act of faith that commits us to be active in that life. That’s why, in 2017, Trinity’s stewardship campaign continues to seek your participation in supporting the Church. We are therefore eager to fulfill our goal for this year -- 100% participation, irrespective of the size of individual contributions. Our Vestry feels strongly that stewardship is an integral part of Church membership. We believe that giving can be a liberating experience, as a personal matter and in sharing in the care of our ministries, facilities, staff, and outreach efforts. Here’s what we can report to date. The Church has received 160 pledge cards in the current 2016-2017 cycle, out of the roughly 200 active giving families and individuals in the Church. That means we are currently at 80% of our goal. If you are among those who have not submitted your 2017 pledge card, won’t you do so today – at whatever level you deem appropriate -- and help Trinity achieve its 100% goal? Thank you! Together, with God’s help, we can move mountains!